The Cold War was on. The United States had approximately 250,000 US military personnel stationed in Germany alone during the 1980’s. If World War III were to break out, Germany was expected to be ground zero. Every US unit, German unit, British unit and other NATO units stationed in Germany, had their portion of the General Defense Plan (GDP) to prepare for and we exercised this battle plan routinely. As a relatively new 2nd Lieutenant stationed in Germany in May 1987, the prospect of war was very real. Every event trained for their Go To War plan, how they would fight and their responsibilities. This included REFORGER exercises where thousands of stateside troops deployed to Germany in support of the GDP, Tank Gunnery Exercises at Graffenwohr, or combat maneuver exercises at Hohenfels against Opposition Forces (OPFOR). For two years, preparing and training for war was a way of life, with many trips away from my German home along the Main River in Aschaffenburg. On November 9th, 1989 everything changed. President Reagan’s outreach to Secretary Gorbachev led to real dialogue and Gorbachev himself had written a book called Perestroika, offering the prospect of new thinking and openness for the Soviet Union and satellite countries. 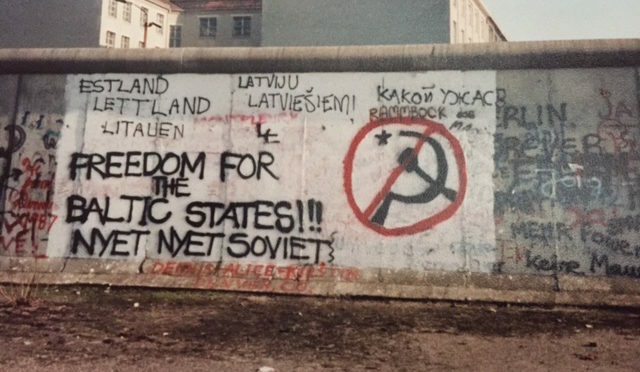 Then, somewhat out of the blue, and unexpected on November 9th, 1989 the Berlin Wall fell when the communist party of the German Democratic Republic (divided East Germany), announced that its citizens could travel to the West freely, and travel they did. More than 2 million East Germans travelled to West Berlin and into free Germany in the coming days. People began using hammers and picks to knock down the wall. Berlin would shortly be reunited for the first time since 1945 and the end of WWII. As a young soldier, it was an amazing time to be stationed in Germany, when east and west began the journey and struggle in reuniting. Being on the autobahn and watching families of East Germans travel west in their tiny Trabant cars was surreal, and a sign of how communist countries had failed their citizens. Trabants were noisy, slow and about 5 decades behind western car technologies. It must have been shocking to the eyes of East Germans to see how the West lived, how much more advanced the Federal Republic of Germany was and in the end, to now understand that their communist governments had been lying to them. Much more change was coming for US units stationed in Germany as a new normal, a time of uncertainty was settling in. No one really knew what to expect next. However, there was a war brewing on another continent and many units from Germany would soon be deployed to fight in Operation Desert Storm.